Alex Selky, going on seven, kissed his mother goodbye and set off for school, a mere two blocks away, He never made it. Desperate to find him, his mother begins a vigil that lasts for days, then weeks, then months. She is treated first as a tragic figure, then as a grief-crazed hysteric, then as an unpleasant reminder of the bad fortune that can befall us all. Against all hope, despite false leads and the desertions of her friends and allies, she believes with all her heart that somehow , somewhere, Alex will be found alive. 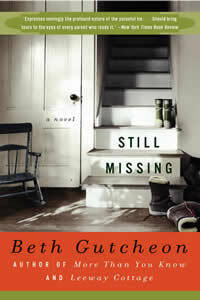 Beth Gutcheon builds a heartrending suspense that culminates in a climax you will never forget.